Agnieszka loves her valley home, her quiet village, the forests and the bright shining river. But the corrupted wood stands on the border, full of malevolent power, and its shadow lies over her life. Her people rely on the cold, ambitious wizard, known only as the Dragon, to keep the wood's powers at bay. But he demands a terrible price for his help: one young woman must be handed over to serve him for ten years, a fate almost as terrible as being lost to the wood. Straight away I knew Uprooted was going to be good, you usually know, don't you when a book is going to be a winner. You start of full of that new book excitement and before you know it its two am and you are halfway through it, forgetting about the fact you have to be up for work in a matter of hours. Our leading lady Agnieszka lives in a charming, small village on the outskirts of a large wood. The wood is not full of shafts of sunlight and pretty flowers, it is full of dark corrupted power, a power that swallows everything in it path and is creeping closer to her village. Agnieszka, her family and friends have their own anti-hero, the Dragon. 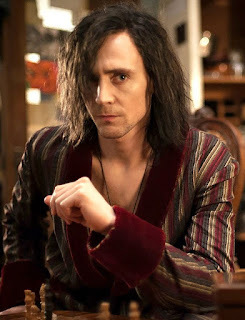 A wizard, he keeps the community safe from the wood and its evil reaches but this safety comes at a price, he takes a young girl from the village to serve him for ten years. Of course the time has come for the next girl to be chosen, and as she is of age Agnieszka is one of the girls that he has to choose from but she knows she won't get taken, her best friend Kasia is a better choice. Beautiful, clever, kind, she is perfect, she knows herself she will be taken, now that makes her sound a bit vain and full of herself but she isn't, she is just lovely. So it does come as a shock when the Dragon picks Agnieszka. Travelling to the Dragon's home Agnieszka fears that she will be used and abused, but a note from a predecessor but her mind at ease and she begins to forge a life with her strange house mate. To be honest they hold such contempt for each other that I was thinking she might poison him with her attempts at cooking but as they sort of bounce of one another and the Dragon comes to realise that he doesn't intimidate Agnieszka. The Dragon teaches Agnieszka to use magic and she proves to be an able student, maybe too able as she demonstrates that she is a strong wielder of the power she is grasping. Their relationship changes considerably too and his character changes from a stuffy, arrogant, aristocratic wizard in to the dark and brooding young man that he is (or was, he is a wizard after all, his wizard driving license has quite an age on it), sparks fly between them as Agnieszka is proving to be his equal. They are no longer servant and master, he becomes Sarkan to her, throwing away his dragon façade his walls come down and he lets her in, yes there is romance but it does not spoil the story and it is definitely not insta love. Uprooted takes us deep in to the dark wood where strange things are stirring, strange things that have the power to take and possess people and they are creeping ever further to the edge of the wood taking more and more victims and spreading the wood ever further. 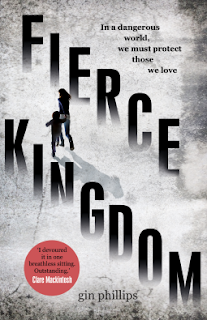 Agnieszka and Sarkan find themselves fighting against the power but have they met their match? Will they be strong enough to defeat it? This was a delicious read with a consistently gripping storyline, I loved the characters especially Sarkan who I pictured as a Tom Hiddleston when he has long dark hair lookalike (Loki/Crimson Peak/Only Lovers Left Alive), he totally did a 360 in my opinion of him but Agnieszka was a great character, selfless and so brave, I kinda hope to hear more from this world as I felt a little bereft when I got the end. 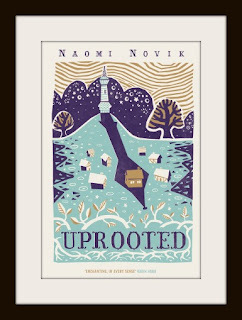 Anyway as a charming fantasy with a subtle hint of menace and wee hint of romance, you cant go wrong with Uprooted. Thank you to MacMillan for providing me with a copy in exchange for an honest review. It was a brilliant read Kristen, hope you check it out! !